Fantina has worked up the ranks and become the Hearthome City Gym Leader. Very little is known about Fantina's Gengar. All that was seen of it was it being used against an Abra and Alan's Nosepass before finally being defeated. In Ash's battle against it, it used its powerful ghost attacks against Ash. 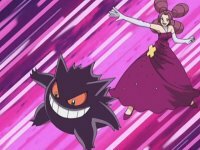 Misdreavus is another of Fantina's Pokémon that did not get shown much. It was utilised within her gym battle against Alan and easily defeated his Nosepass. Since then, it evolved into Mismagius.